Q. How do I cite American Jurisprudence in an APA paper? The APA Manual provides explicit directions for the citation of cases, statutes, and administrative materials, but defers to the latest edition of The Bluebook: A Uniform System of Citation (Bluebook;20th ed., 2015) for creating citations for other legal materials. American Jurisprudence (AmJur) is a secondary source-- a legal encyclopedia to be exact -- and the citation is governed by Rule 15 of The Bluebook. Rule 15 "governs the citation of books, treatises, reports, white papers, dictionaries, encyclopedias, and all other nonperiodic materials" (Bluebook;20th ed, 2015, p.138). You will probably be searching AmJur in electronic format and that is fine. The same rules apply. Volume number Am.Jur. edition number Article Title § section number (year). 17 Am.Jur. 2d Contracts § 74 (1964). *The "white pages" dictate the citation style for scholarly writing and Law Review articles. *The basic difference between the white pages citation and the blue pages citation is that the article title is typed in italics in the white pages version and is underlined in the blue pages version. 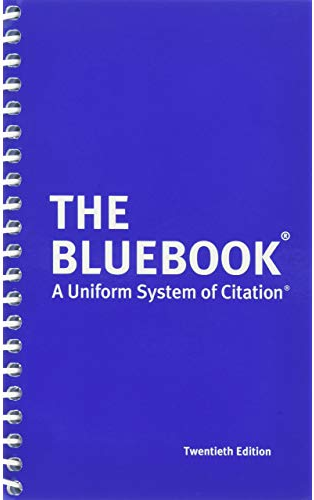 The bluebook: A uniform system of citation (20th ed.). (2015). Cambridge, MA: Harvard Law Review Association.